Once again Founders puts forth a phenomenal brew! Like many of their limited bottle releases, this beer was an experiment in their tap under the name Kaiser’s Curmudgeon. This beer bares a great name and stellar label. The Ol’ Mudge (as I like to call him) sits poised ready to dig into a stack of flapjacks with a surly look on this face. His loving wife stands beside with a pitcher of syrup. What makes this beer different (better) from the base is that it is aged for 254 days in Bourbon barrels that once held maple syrup. Founders is no stranger to those types of barrels as their CBS is one of the most highly acclaimed beers on the market. 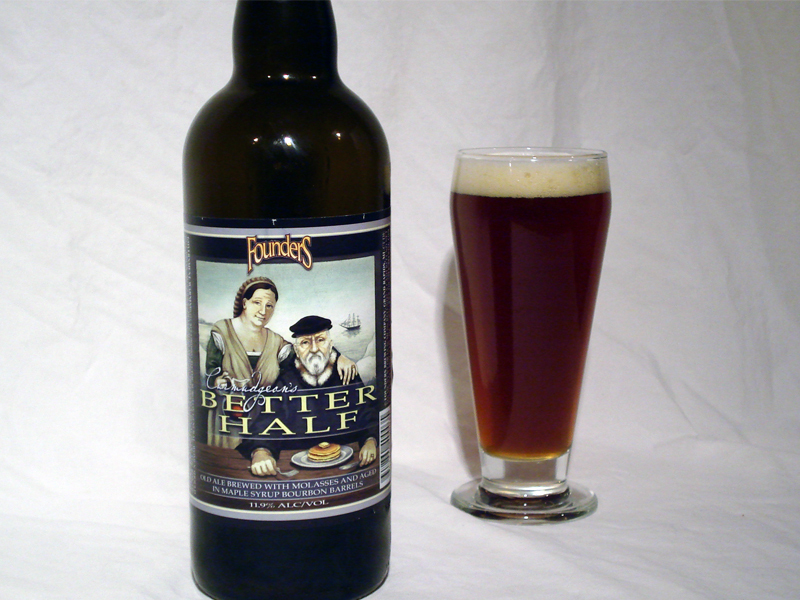 Better Half clocks in 2.1% higher in abv so make sure you enjoy this as an easy sipper. The color on this beer is slightly darker than Ol’ Mudge himself and hazy. It is unfiltered and there is plenty of sediment at the bottom so make sure you let the bottle settle for a few days. Even then, decant as you pour and you should end up with a beautiful Bourbon, mahogany, bronze beer. The head takes a while to form as the bubbles fight through the thick liquid. Once formed, it is a shade darker beige and is creamier than the base beer. For being so high in alcohol I thought there would be some legs, but to my surprise they were minor. A fine looking beer I must say. A sugary malty bomb hit my nose as I poured this beer. Sticking my nose in the glass there was an amazing blend of Bourbon notes, maple goodness, and deeper molasses. Very toasty malts danced in between the sugar providing some warmth and to the mix. Speaking of warmth there was a alcoholic heat coming up that helped to boost the sweeter character out of the glass. A familiar oakiness was evident, but a deeper charred wood component added some depth. In 2009 I went on a missions trip to the Netherlands. While there, I encountered Stroopwafel and could not get enough. Their are small pastries consisting of two thin layers of baked batter pressed together with a rich caramel/syrup in the middle. Treacle was used as well. At any rate, sometimes the bigger stroopwafel would be placed over a cup of coffee to warm the center and bring out that ooey-gooy flavor. This beer tastes just like stroopwafel (with a little extra boddy) and I love it! The malts are present and add the backdrop for the sugar and molasses to work their magic. Biscuity, toasty, roasted, and caramel-like, the malt base blend very will and compliments the rich molasses quality that seems to absorb the maple syrup quality as well. Both are then highlighted by a great oak character that is more complex and burnt than Ol’ Mudge. The barrels once held Bourbon and that is what you get infused into this beer. The flavor profile already had minor hints of molasses so this beer fits like a glove. A booziness does help to cut the sweetness a little, but for the most part that is the main focus. I enjoyed the rather heavy mouthfeel as sugars from three places converged on my palate (malt, molasses, maple syrup). The most dominate flavor was maple which only made me want to pour this moderately viscous liquid on my pancakes. Toward the end of each sip a smooth sugary and caramel wood sugar flavor lapped over my tongue. This was followed by a charred wood dryness (with a touch of sweetness) that reminded me of Canadian Breakfast Stout minus the burnt grains. I appreciated being able to experience this sensation again, but in a different beer. My lips and the rim of the glass were sticky at the end. A very sweet beer indeed, I would recommend laying this down for about 6 months to a year. The sugars should get eaten up a little and the abv heat might mellow. However, the flavor it has right now is top notch. It was still Old Curmudgeon at its core so all those great flavors were present…just add a tender loving touch of a maple syrup Bourbon barrel.